The compact and versatile solution for precision engraving. The M20 range offers models to enable the engraving of small signs and plates, badges, jewellery and personalisation applications such as pens and giftware. 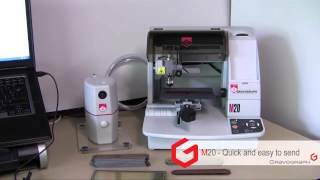 The M20 includes numerous different devices and accessories; which allow for diamond drag engraving, deep engraving on different types of materials and the cutting of fine materials. Its compact, quiet, low maintenance design makes it easy to install in a retail environment or small workshop. The Bluetooth option removes the need for cabled communication with your PC, laptop or tablet, making positioning the M20 more flexible. Controlled from a computer or tablet, this machine allows you to perform all types of engraving on small items: including jewellery, signage, pens, badges, personalised giftware and much more. Options include pen engraving, inside & outside ring engraving and photo engraving. All models have a self-centring vice to ensure that the item to be engraved is held securely and in the correct position. An extensive range of jigs to fit the vice means that almost anything can be held for engraving. We've optimised the ergonomics of these compact engravers to integrate a large number of functions into a small space. Features such as the self-centring vice, the Point & Shoot device and the regulating nose allow you to easily and efficiently operate the machine. The pen and ring engraving devices each integrate into the machine without increasing its footprint. With a choice of levels, our purpose written engraving software will allow you to choose the features essential for your application. Intuitive in use yet very powerful, the design of your engraving, both text and symbols, will be completed quickly and easily. A full range of digitised engraving fonts plus the standard computer fonts will ensure that your design flair is not limited. With the option of a picture driven, selection style software package even the most inexperienced operator will be able to work the M20 engraver. 2-way communication between the M20 and its software will ensure that you are always in control. 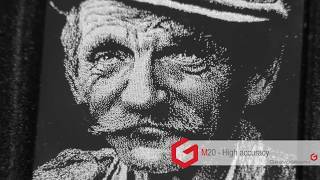 The M20 is one of the lightest and smallest engraving machines in our range. With its compact design and weight of just 10kg, this machine can be easily moved for use at fairs or events. Perry Watkins, Director Timpson, UK.